Shinji Hashimoto stepped up to the stage at the PlayStation Experience keynote to announce that Final Fantasy VII will be re-released for PlayStation 4. Before you get too excited, it’s the PC version of Final Fantasy VII with upscaled graphics. This is *not* a remake though. 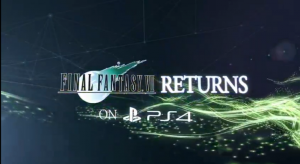 Final Fantasy VII for PlayStation 4 is scheduled for spring 2015.